Well, before too long, I'm going to shift from writing about the past to writing as memories are made -- in Paris! We're leaving next Wednesday and will be there for two weeks. I intend (I have to say "intend," because we all know what happens when you're traveling) to blog about our experiences, but I'm hopeful that this time I'll be able to do more because we have an apartment and will be staying in one place the whole time (except for a small overnight trip my husband and I are taking to Bruges -- very excited about that!). 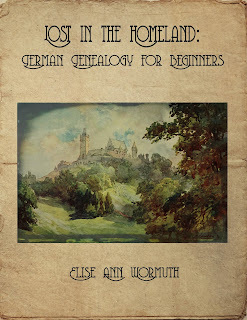 I've been working very hard on my e-book on researching German genealogy, and I think it's going to be good. The book has grown out of a series of posts I did that have now been visited over 7600 times! I have some excellent editors who are contributing a great deal, and soon I'll be doing a bit of "crowd sourcing," asking for a few people to be "early readers" -- I'll send you a free copy of the book if you'll read it and send me a few comments, and you'll be acknowledged in the final copy! If you're interested, let me know, although it won't be done quite yet. 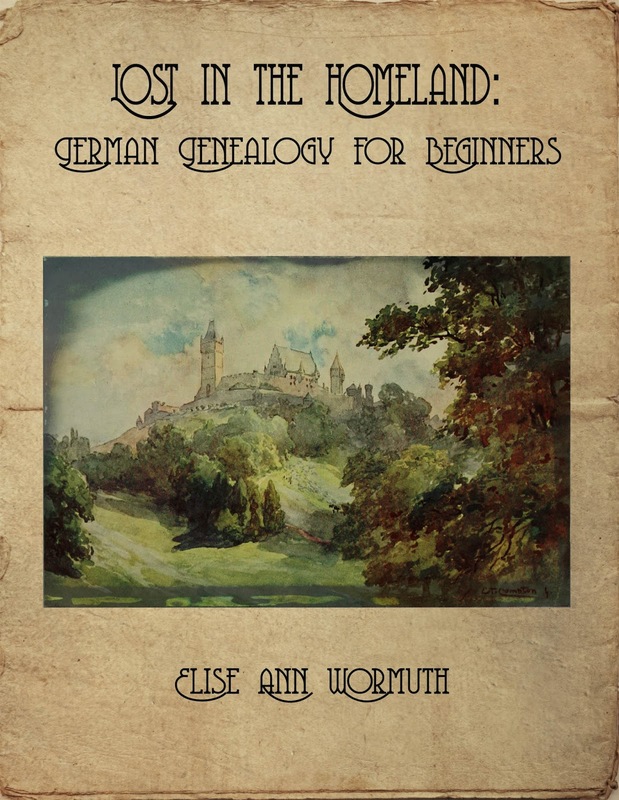 The "cover" of my e-book; it will have beautiful illustrations from a 1912 book. I'm happy with how it's shaping up -- there are three case studies from my own research, one on using United States resources, one on using German resources, and the third a cautionary tale on what not to do, arising out of some hard-won experiences. In addition to the three case studies, there are extra chapters that list many resources beyond those I used in the particular case studies. I'm excited about how it's organized and about the information I'll be able to pass along! Prior to leaving for Paris, we've been having a bit of a French film festival. Today I watched the film called "Hugo" -- what a wonderful movie that is! I don't know how I missed it when it came out. I loved everything about it, the story, the characters, and the film itself, and Paris within it, is just gorgeous. If you haven't seen it, do! 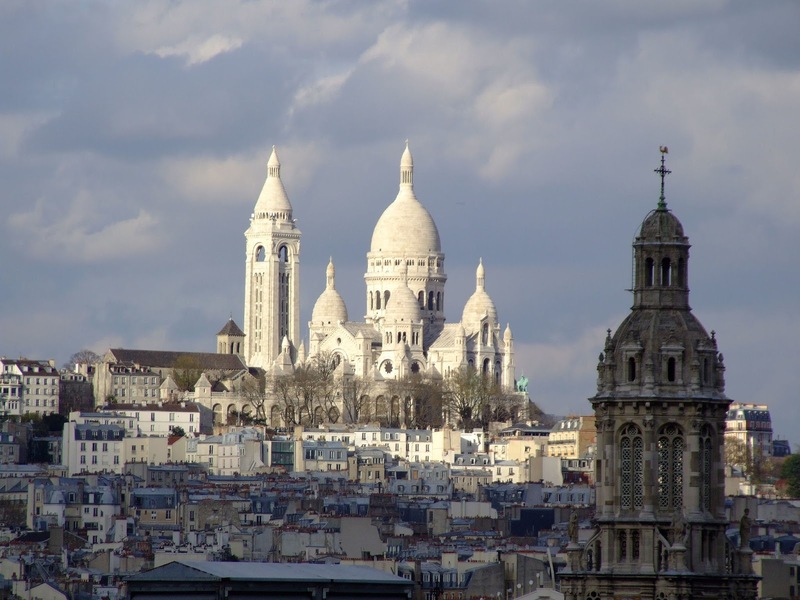 Here's the Sacre Coeur cathedral in Paris -- our apartment is right at the bottom of this hill in Montmartre. 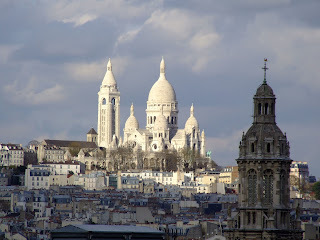 From the top of the hill, you can see all over Paris! Can't wait to be there. Stay tuned; will be posting soon! Oh, how exciting, Elise! Looking forward to reading your posts as you blog about your experiences. Here's hoping you always travel within pockets of wifi accessibility! I'm also looking forward to reading more about your side trip to Bruges. I'm writing this as I sit beneath my favorite poster, a photo of a canal in Bruges. I hope you post about this part of your trip as well! I certainly will! To be honest, we're going to Bruges because my husband and I love the film "In Bruges" so much we just had to take a side trip. I think (I hope) we will be there the weekend that the Christmas fair is opening, so that will make it even more magical. I'm really looking forward to that part of the trip! As for wifi, the apartment in Paris has it, and that's where we're staying for the full two weeks. So I hope to be able to blog a lot, if I'm not too exhausted!